Jean-Baptise Glomy(1711–1786) who is responsible for its re-popularization. One of the key historical periods of the art was in Italy during the 13th to 16th centuries. used is described It has also been used throughout Europe since the 15th century, appearing in paintings, furniture, drinking glasses and similar vessels and jewelry. It is also often seen in the form of decorative panels of mirrors, clock faces, and in more recent history, as window signs and advertising mirrors. 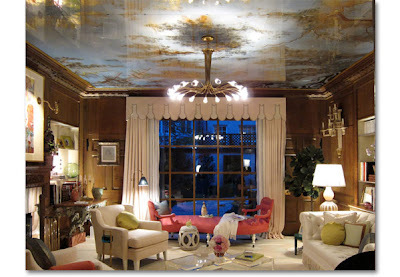 I think this ceiling is absolutely STUNNING!